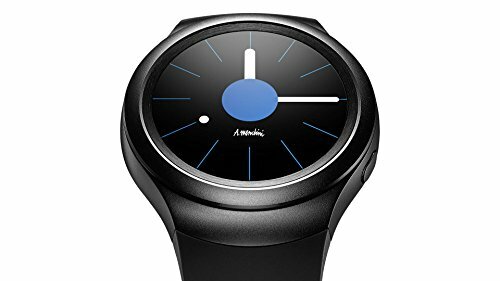 Introducing the New Samsung Gear S2 - With its sleek design and notifications at‑a‑glance, the Gear S2 keeps you dialed in. Now you can choose from premium finishes to compliment your individual style. Express yourself with a selection of customizable watch face designs to make your Gear S2 a device for all occasions. Apps for Every Moment - Get important notifications with just a glance at your wrist. Compatible with Most Android Smartphones (Android 4.4 and later). With built-in wireless charging, it's easy to keep the Gear S2 powered up - simply set it on the included wireless charging dock. With supported GPS navigation, you'll stay dialed-in while you're on the go. It also features a larger watch face and a larger battery with a thicker case - so you can stay connected for longer. Battery charging tips and precautions • If there are obstructions between the Gear and the wireless charger dock, the Gear may not charge properly. • Prevent the Gear and the wireless charger from coming into contact with sweat, liquids, or dust. • If the battery is completely discharged, the Gear cannot be turned on immediately after being connected to the charger. Allow a depleted battery to charge for a few minutes before turning on the Gear. • If you use multiple apps at once, the battery will drain quickly. To avoid losing power during a data transfer, always use these apps after fully charging the battery. • Using a power source other than the charger, such as a computer, may result in a slower charging speed due to a lower electric current. 1.2-inch 302dpi Display. Wi-Fi: 802.11 b/g/n/e (2.4GHz) - Bluetooth: v4.1.Dual core 1.0 GHz Processor. 4GB Internal Memory - Tizen OS. Gear's touch screen works improperly or lags/Your Gear's touch screen responds slowly.- Unclean hands Make sure that you are only using clean, dry hands while operating the device. The use of objects, wet hands, or dirty hands may result in malfunction.